Robert Rolnick Attorney at Law Social Security (All Law Firms) is practicing law in Houston, Texas. This lawyer is listed on Lawyer Map under the main category Social Security Lawyers in All Law Firms. 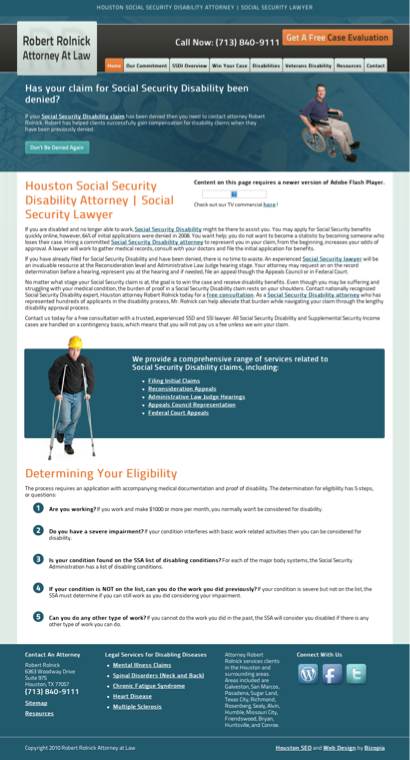 Robert Rolnick Attorney at Law Social Security is listed under All Law Firms in Houston, Texas . There's currently no information available about fees or if Robert Rolnick Attorney at Law Social Security offers free initial consultation. The information below about Robert Rolnick Attorney at Law Social Security is optional and only visible if provided by the owner. Call (713) 840-9111 to learn more. Do I have a case for disability considering the following circumstances? : I've had a lower back problem for 6-7 years. I have been treated by a chiropractor and have recently seen another Dr. for treatment, which was 1 Rx. The plan is for me to get on a reduced cost medical program before I can have an MRI done. I am in excruciating pain every day and it's getting worse with no treatment for the pain. I am willing to sign a release of info. form so you can get my information. Can you help? Contact Robert Rolnick Attorney at Law Social Security to find out about hours of operation / office hours / business hours. Listed business hours are general only. Call (713) 840-9111 to learn about office hours.